My mother who was born 1923 gave me these Vaseline Glass candlesticks and candy dish when she was alive. They were my Grandmothers and she was born in 1903. No-one wanted them but me, and no one is alive now that can tell me anything about either the Vaseline glass candlesticks or the candy dish. I think I know how old they are. But I’m hoping someone here can confirm the age and help me out with how to find out how valuable they may be. 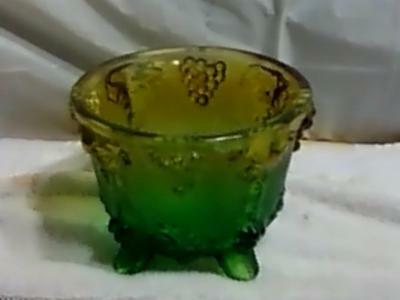 I have one the same and it was sold to me as Vaseline glass. Mine is exactly the same but etched around the base and top. I would love to know its age as well. Stunning to look at – just gorgeous. 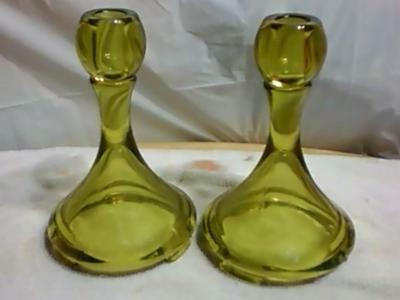 Those don’t really look like vaseline glass. If they are they will glow green under a black light (U/V light). Use a fluorescent or LED black light, not a bulb; the bulbs don’t work, I tried one.